Prolonged sun exposure is hard on skin. 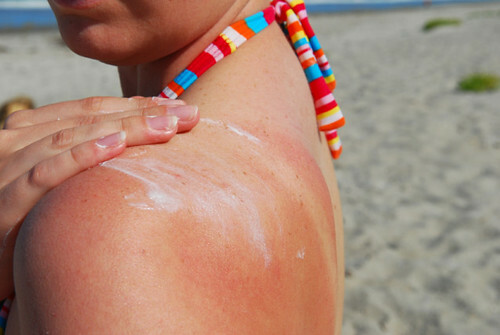 Even one sunburn leaves painful, lasting damage. Additionally, a person’s risk for melanoma doubles after receiving five or more sunburns, according to The Skin Cancer Foundation. But what actually happens to your skin when it burns? In this blog, Joel Schlessinger MD shares what gives skin that painful red appearance. Sunburn is the skin’s response to UV exposure, Joel Schlessinger MD explains. It doesn’t take long for skin to burn. After just 10 minutes of intense sun exposure, the skin starts to defend itself against UV damage. A sunburn’s characteristic redness is the body’s inflammatory response to signal that there are skin cells that need to be repaired. The body also starts sending blood to the exposed area to assist in the healing process, making skin warm to the touch long after sun exposure. Severe sunburn can lead to blisters and peeling skin. Blisters are the body’s way of protecting areas with tissue damage. Peeling skin is the body’s attempt at ridding itself of damaged cells that could become cancerous. Under less intense sun exposure, skin responds by producing melanin to try to protect cells from DNA damage. This melanin gives skin the appearance of a tan. Although skin isn’t turning red, any change in skin color is a sign of damage. Joel Schlessinger MD shares tips on how to care for sunburned skin. Although it’s best to avoid a sunburn altogether with regular sunscreen application, there are things you can do to help the healing process. If you feel your skin start to tingle or see signs of redness, get out of the sun and take Advil immediately. Advil acts as an anti-inflammatory that helps minimize the severity of a sunburn. It won’t completely prevent a burn, but it can stop skin from blistering before it starts. Then, soothe skin with a cool shower and apply LovelySkin Aloe Vera Soothing Skin Relief Gel to help calm and heal sunburned areas. You can relieve discomfort by applying FixMySkin Healing Body Balm with 1% Hydrocortisone to affected areas up to three times a day. This balm contains hydrocortisone to soothe irritation and hydrating shea butter and cocoa butter to prevent peeling and flaking skin. If you think you’ve had too much sun exposure, taking Heliocare Sun Protection Pills can also help minimize a burn. Do you have a question about sunburns for Joel Schlessinger MD? Share with us in the comments. In a recent viral video, videographer Thomas Leveritt shows people on the street what they look like under ultraviolet light, exposing sun damage beneath the skin. The ultraviolet camera reveals changes to their skin that aren’t yet visible to the naked eye such as freckles, wrinkles and other signs of UV damage. With this video in mind, Dr. Joel Schlessinger shares what you can do to protect yourself from sun damage and keep your skin looking youthful. Applying sunscreen every day protects your skin from premature aging, sun damage and skin cancer, Dr. Joel Schlessinger says. Contrary to popular belief, there is no such thing as a safe tan. Any change in your skin is a sign of sun damage. This damage doesn’t make itself known right away, either. Over time, sun exposure can lead to signs of aging like dark spots, fine lines and wrinkles. UV exposure also creates an uneven skin tone and breaks down collagen and elastin in the skin, giving the complexion a saggy appearance. Most skin cancer is caused by too much UV exposure. In the early stages, it usually resembles a freckle or a mole that can change in size, shape or color. The best way to avoid skin cancer is through regular self checks and visits to your dermatologist. This will also improve your chances of catching it early when it’s easily treatable. The best way to protect your skin from sun damage is to wear sunscreen every day and stay out of the sun. Apply a daily sunscreen and avoid outside activities during peak hours when the sun is directly overhead. Following these basic rules will help keep your skin looking youthful and healthy, Dr. Joel Schlessinger says. Dr. Joel Schlessinger recommends applying a broad spectrum sunscreen every day for healthy skin. When shopping for sunscreen, many people only look at the SPF, which is not the best way to determine if your sunscreen is adequate. SPF only explains how well a produce protects against UVB rays, not UVA. Both UV rays cause skin cancer so it’s important to choose a broad spectrum formula. Dr. Joel Schlessinger recommends EltaMD UV Clear SPF 46 Broad Spectrum Sunscreen, which protects against both UVA and UVB rays without irritating sensitive skin. As a general rule, Dr. Joel Schlessinger and other dermatologists recommend applying a sunscreen with a minimum of SPF 30 and reapplying every two hours. For optimal sun protection, avoid excessive sun exposure between the hours of 10 a.m. and 2 p.m. when the sun is most intense. It’s also important to protect your skin with proper clothing such as loose-fitting long sleeve shirts and pants, as well as wide-brimmed hats. We’ve all heard the myth that sun exposure is a must if you want your daily dose of vitamin D. With sunscreen use on the rise, some are worried that constant UV protection could cause a vitamin D deficiency. Dr. Joel Schlessinger explains the link between this essential vitamin and your skin. Sun exposure isn’t the best way to boost your vitamin D levels, Dr. Joel Schlessinger says. When exposed to direct sunlight, skin reacts with the UVB rays by producing vitamin D. The body’s ability to create this vitamin decreases with age so it’s impossible to get enough vitamin D without harming your skin in the process. Even people with tan skin can have low levels of this essential vitamin, so the idea that tanning will increase levels of vitamin D isn’t always true. UVB rays, along with UVA rays, can cause skin cancer. For this reason, it is important to apply a broad spectrum sunscreen like EltaMD UV Clear SPF 46 Broad Spectrum Sunscreen every morning. Instead of risking harmful sun exposure, Dr. Joel Schlessinger suggests taking vitamin supplements that provide about 2,000 units of vitamin D3 each day. These will also help support healthy teeth and strong bones. Vitamin D can also be applied topically for additional skin care benefits, explains Dr. Joel Schlessinger. In addition to daily supplements, vitamin D can also be applied topically to provide skin care benefits. Dr. Dennis Gross Skincare Active Vitamin D Serum-Oil helps minimize acne, improve skin elasticity, stimulate collagen production, enhance skin radiance, minimize fine lines and diminish dark spots. Unlike most vitamin D oils, this serum does not need sunlight to activate the vitamin D. You’ll enjoy a more youthful complexion with regular use of this anti-aging formula. Do you have questions about vitamin D for Dr. Joel Schlessinger? Share with us in the comments. When it comes to proper skin care, many people know sunscreen is an essential. However, with myths and other false information floating around, there are still consumers who may not understand the full story on the ways of sun protection. As a board-certified dermatologist, Dr. Joel Schlessinger always wants people to know the truth. Myths about tanning, skin cancer and UV damage can lead to harmful sun exposure, Dr. Joel Schlessinger explains. When looking for a sunscreen, many consumers only look at the SPF, which is not the best way to determine if your sunscreen is adequate. SPF only explains how well a product protects against UVB rays, not UVA. Both types of UV exposure cause skin cancer so you need a product that is designated as broad spectrum such as EltaMD UV Clear SPF 46 Broad Spectrum Sunscreen. Two common misconceptions include the belief that having a darker skin tone or getting a “base tan” will protect you from sun damage. This is untrue as a base tan is only good for about an SPF of 4! People with dark skin tones are still at risk for skin cancer and need to protect themselves with sunscreen. Additionally, tanning isn’t safer than burning as any change in skin tone indicates UV damage. Many individuals also believe the sun’s rays can’t penetrate through clouds, windows, umbrellas and other objects. Sunscreen is still essential when the sky is overcast, while you’re under a beach umbrella or spending your day at the office. Sun damage can reach through clouds and windows. Additionally, the sun’s rays can reflect off of sand or snow. 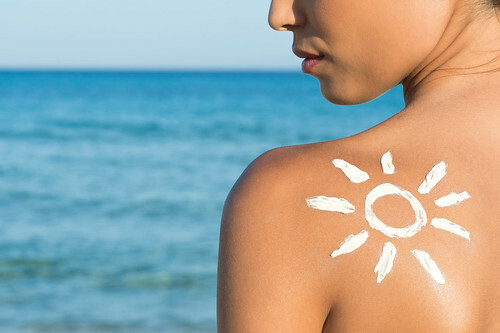 It’s important to know the truth behind sunscreen myths, says Dr. Joel Schlessinger. There have been several debates about the safety of chemical ingredients in sunscreen, leading people to believe these products can cause allergic reactions or harm the skin. With physical, mineral and chemical formulas to choose from, however, it’s easy for everyone to find a sunscreen that works for their skin type. Dr. Joel Schlessinger and other dermatologists recommend applying a sunscreen with a minimum of SPF 30 and reapplying every two hours. However, sunscreen is only half of the equation. For optimal sun protection, avoid excessive sun exposure between the hours of 10 a.m. and 2 p.m. when the sun is most intense. It’s also important to protect your skin with proper clothing such as loose-fitting long sleeve shirts and pants, as well as wide-brimmed hats. Heliocare Sun Protection Pills are daily supplements that can provide added UV protection. Read more sun safety tips from Dr. Joel Schlessinger here. Do you have questions about sunscreen for Dr. Joel Schlessinger? Share with us in the comments. With warm weather approaching, it is important to take steps to protect yourself from harmful sun exposure. Check out these tips from Joel Schlessinger MD on how to keep you safe in the sun. Joel Schlessinger MD explains what to look for in a sun protection product. You should always read the labels of your sun protection products before you purchase them to make sure you are receiving proper protection. Many people only look at the SPF, which is not the best way to determine if your sunscreen is adequate. SPF only explains how well a produce protects against UVB rays, not UVA. Both cause skin cancer so you need a product that is designated as broad spectrum. Additionally, just because a product has an SPF higher than 50 does not mean that it protects any better than a product with SPF 50. A broad spectrum sunscreen such as EltaMD UV Clear SPF 46 Broad Spectrum Sunscreen offers protection against both UVA and UVB rays. Knowing the correct way to apply sunscreen is just as important as the product itself. You should apply approximately a nickel-size amount to the face and about two tablespoons, or one shot glass, to the body. You must reapply at least every two hours. You should also choose a sunscreen that is labeled water-resistant that will provide between 40 and 80 minutes of protection when skin is exposed to moisture. Follow basic sun safety rules to protect yourself, says Joel Schlessinger MD. Avoid excessive sun exposure between the hours of 10 a.m. and 2 p.m. when the sun is most intense. You can also defend your skin against damage by wearing loose-fitting long sleeve shirts and pants, as well as wide-brimmed hats for added protection. Along with proper clothing and sun protection products, you can also take supplements such as Heliocare Sun Protection Pills that provide added UV protection. This pill can be taken daily to improve resistance to UV rays but must still be used with your regular sunscreen. Do you have questions about sun protection? Ask below in the comments section. Sunburned skin is not the only sign of sun damage. Contrary to popular belief, there is no such thing as a “safe” tan. Any change in the color of your skin is a sign of sun damage. In his most recent presentation, Joel Schlessinger MD discusses how to recognize sun damage, the best way to protect yourself and what you can do to reverse existing damage. Sun damage can cause premature signs of aging and skin cancer, Joel Schlessinger MD explains. Dark spots, fine lines and wrinkles are a common sign of sun damage. UV exposure creates an uneven skin tone and breaks down elastin in the skin, which gives the complexion a saggy and aged appearance. Most skin cancer is caused by too much UV exposure. In the early stages, it usually resembles a freckle or a mole that can change in size, shape or color. The best way to avoid skin cancer is through regular visits to your dermatologist. This will also improve your chances of catching it early when it’s easily treatable. Joel Schlessinger shares tips on how to prevent sun damage. The best way to prevent sun damage is to avoid direct sun exposure and keep your skin well protected. Apply a daily sunscreen like EltaMD UV Clear SPF 46 Broad-Spectrum Sunscreen and avoid outside activities during peak hours when the sun is directly overhead. Heliocare Sun Protection Pills can give your regular sunscreen a boost. These daily supplements build up your body’s natural defense against UV damage. Wearing a hat and clothing with SPF also help shield your skin. Joel Schlessinger MD suggests treating existing sun damage with an anti-aging formula like SkinMedica TNS Essential Serum. This serum combines growth factors, peptides and antioxidants to diminish the look of dark spots and wrinkles.